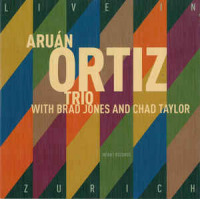 Live in Zürich is the twelfth album from Cuban avant-garde composer and pianist Aruán Ortiz. Of those recordings widely available in the US, Ortiz has worked with a variety of group formats. His quartet released Orbiting (Fresh Sound New Talent, 2013), was followed by a trio outing on Hidden Voices (Intakt Records, 2016) and two successive solo recordings, Cub(an)ism (Intakt Records, 2017) and the vinyl-only Cuban Nocturne (Newvelle Records, 2017). Ortiz continues to grow a global fan base after two decades as a leader or collaborator, initially in his native country. With early comparisons to Chick Corea and Ornette Coleman (as a composer), one could comfortably add Matthew Shipp to the list of creative forces that may be heard in Ortiz' composing and playing. Bassist Brad Jones has worked with Marc Ribot, Elvin Jones, Ornette Coleman, Misha Mengelberg, and Han Bennink. In the 1990s he worked with Muhal Richard Abrams to whom Ortiz dedicates this album. Jones led his own group—AKA Alias—which included guitarist David Gilmore who was part of Ortiz' Orbiting quartet. Chad Taylor is best known as one-half of the Chicago Underground Duo with Rob Mazurek. Along with a number of Mazurek led groups, the composer and percussionist has worked with Fred Anderson, Derek Bailey, Cooper-Moore, Pharoah Sanders, Marc Ribot, Peter Brötzmann, Malachi Favors and many others. His own group, Circle Down, released a highly regarded, self-titled album in 2009 on the 482 Music label. Live in Zürich was recorded at Zürich's Unerhört!-Festival in late 2016, and the album consists of two extended tracks and a closing piece. "Part 1: Analytical Symmetry/Fractal Sketches" reimagines two Ortiz tracks from Hidden Voices. That trio featured Eric Revis on bass and drummer Gerald Cleaver and the new lineup has a fresh perspective on this one-half hour amalgam. Chad Taylor's mbira adds an intriguing African flavor to the opening; the notes manifest in distinctive tones that maintain a purity, then fade almost immediately after each is plucked. Jones bowed bass and Ortiz' percussive low end make for an eerily exotic brew that transitions multiple times from lyrical to thundering. No stranger to the classics, Ortiz takes on Chopin following a three-minute, deeply involved bass solo. "Part 2: Bass Improvisation/Etude #6 Op 10/Open Or Close & The Sphinx" treats its classical components with energized enthusiasm before moving into a free arrangement of the Ornette Coleman closing portion of the piece. "Alone Together" is a song composed by Arthur Schwartz in 1932 and for the first half of its eight and one-half minutes, bears little resemblance to the standard. The intentionally slurred, yet comfortable open gives way to loping piano, truer to the original but with a distinct edge. The song closes with Ortiz dropping singular notes that seem to imitate the mbira of the opening. Live in Zürich captures Ortiz in a way that studio recordings find difficult to mimic. Ortiz previous live recording was Banned in London with the Michael Janisch Quintet (Whirlwind, 2012) was more of a jam, and included a dominating Greg Osby saxophone rendering Ortiz' energy obscured in the mix at times. In these smaller formations, the pianist and his well-chosen bandmates shine. Here, the rhythm section is much more functional and entertaining than that, and their skillful balance between melody, tautness, and exploration is as good as it gets. Muhal Richard Abrams would be proud. Track Listing: Part 1: Analytical Symmetry/Fractal Sketches; Part 2: Bass Improvisation/Etude #6 Op 10/Open Or Close & The Sphinx; Alone Together.